Castro has emerged from his hut. He pointed a finger at the U.S., rather than North Korea, for sinking the South Korean ship that killed 46 sailors this spring. 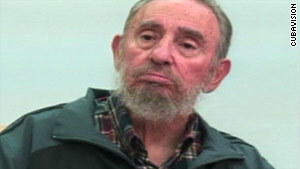 Our motivation, according to Castro? To stir up controversy in the region. There's something very unsettling about a woman stripping while talking about Fidel Castro.